I love football. I know love is a strong word. My wife tells my kids and I to think about that when for instance, one of my boys says he loves pizza; “we love each other”, she says…we just really like other things like pizza and football. But, you know, I think I really do love football. I grew up with Saturdays on the couch watching college football and Pat Summerall and John Madden broadcasting the NFL on Sundays. I played high school football. I played intramural flag football in college and the first few years of my Air Force career. I have been in the same fantasy football league for almost 20 years. And I’ve coached several seasons of youth flag football. Of all the sports I have played, coached, or watched, it is definitely my favorite. However, over the last few years, the depth of my devotion to the sport has been challenged. And I am not alone. With the increasing information about concussions and other injuries, many people have been struggling with what Tim Keown calls the “Grand Reconsideration” in his piece in the July 8, 2013 ‘Kids In Sports’ issue of ESPN The Magazine: i.e. Should I let my son play football? Many are deciding the answer is “no”. According to the Sports and Fitness Industry Association, participation in tackle football fell 26.5% among US kids ages 6 to 12 from 2007 to 2013 and according to the National Federation of State High School Associations, football participation in US high schools was down 2.3% in the 2012-13 season from the 2008-09 season. According to a Bloomberg Politics poll last December, “50 percent of Americans would not want their sons to play football” (quote taken from ESPN the Magazine article on Chris Borland mentioned below). Even President Obama, when asked this question, replied “If I had a son, I’d have to think long and hard before I let him play football”. My high school football coach would correct people that said football was a contact sport; he would say it is a collision sport. The violence of these collisions is part of what both attracts us to and repels us from the sport. The act of putting on the shoulder pads and helmet, lining up against an opponent who may be bigger and stronger than you, and willfully engaging in a physical test takes courage. 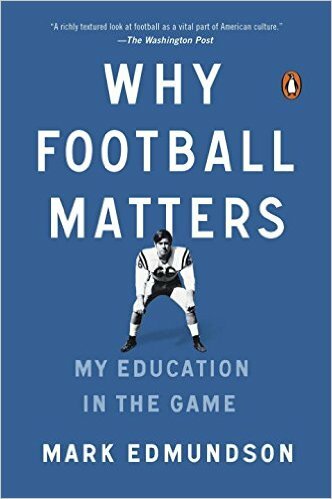 In his book Why Football Matters: My Education In the Game, Mark Edmundson highlights how football “teaches one thing kids can’t get anywhere else. It teaches them how to get knocked down and get back up”. Enduring the challenges football avails as part of a team of peers builds some of the greatest bonds young men can form as well. Keown captures it this way: football “gives you something you don’t get anywhere but in a war, a reference point that allows you to face any of life’s difficulties – mental, physical, emotional – through the sweaty prism of a double-day workout in 102-degree heat. If I could get through that, I can get through this“. 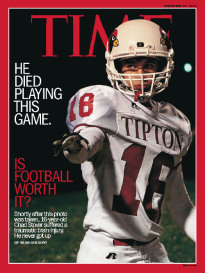 As Amy Stover, the mother of Chad Stover, whose death is the subject of ‘The Tragic Risks of An American Obsession’ article in the Sept 29, 2014 issue of Time magazine, says, “Football really, really promotes community”. Think something like Friday Night Lights (the fantastic book, the decent movie, and/or the excellent TV show! ); the players form a bond, the parents a shared anxiety and excitement, and the town a gathering place and common discussion topic. At what point, however, are the risks too great to counter the benefits of playing football? As Keown asks: “If football is something you hope to survive intact, with working limbs and kidneys and a brain that functions into your 50s, how is it defensible?” Earlier this year, Chris Borland decided to retire from the NFL after one season in the league. He cited the risk of traumatic brain injury as the reason. According to a National High School Sports-Related Injury Surveillance Study (as reported in the Time magazine article cited throughout this post), football led to more concussions than any other high school sport in the 2013-2014 school year with 33 per 10,000 players (girls’ soccer was second with 18 per 10,000 players). Further, the concussion that led Borland to retire occurred on a routine play – and that factored into his (and every parent’s) decision. Sure you can get a concussion from a bicycling or driving accident; in football, the danger can increase even when you do everything right. The reality is that it simply isn’t possible to play football without getting hit in the head. With my boys, my wife and I had decided that they wouldn’t play tackle football until high school (I didn’t play until high school). They played several seasons of flag football and really enjoyed it. We changed our minds when the boys were in middle school and the school had 7th and 8th grade teams. We rationalized the decision by saying that the boys would be coached by people trained in proper football fundamentals and have an athletic training staff available to diagnose and treat injuries (not usually the case with pee wee or Pop Warner youth football). They both played through their freshman years in high school. In October of 2013, during their freshman season, in response to reading an editorial on CNN, “Why I’m Saying Goodbye to Football“, I took to Facebook to get advice from my friends. I wrote: As you know, I have two boys who are playing high school football . One has had two concussions already. This article is another in a long line where folks are considering or regret letting their kids play football due to the possible long term implications. Am I being irresponsible? Or, is it that for every instance of long-term damage that I read, I think I know of at least a half-dozen or more who made it through their football careers unscathed – and moreover with significant memories and even life lessons about competition and teamwork. I justify the decision as not wanting to limit the boys’ activities due to fear. But, I have always said “There’s a fine line between courage and stupidity”. The replies were a mix of ‘you can’t protect your kids from everything’ for continuing to play and ‘I’ve already decided my son won’t play when he gets older’ against it. What we did was try to lessen the risk of head injury by requiring our boys to wear Dome padded skull caps under their helmets and, for my son with the concussion history, a Guardian cap over his helmet during practice (they are not allowed during games in Ohio). We were likely experiencing aspects of the ‘Grand Reconsideration’; i.e. “some hedging, some hope and some willful ignorance”. We hedged on our decision to wait until high school. We hoped that the boys would be protected with the additional measures. And, we showed some willful ignorance as we demonstrated the conflicted nature of the football parent: looking forward to the game all week and (sort of) dreading it once it started. I have no regrets about how my boys did it, though. One of my boys decided not to play as a sophomore (non injury-related; he just decided he didn’t want to play anymore). After playing as a sophomore, my son with the two previous concussions decided not to play his junior year (this season). With respect to counseling him, I didn’t want him to stop doing something he really enjoyed because he was afraid. But, I applaud the maturity of his decision – he said it was because he would like to join the armed forces and understands that they are cautious of the number of concussions a recruit has had. However, when asked if he misses it (he is a student athletic trainer for the football team), he told me that he sometimes wants to run out there when the coaches call for the position he used to play. Football is like no other sport in terms of the camaraderie and shared experiences that it provides. But, it is also quite risky…thus the question remains. What do I recommend with respect to youth football?